Kristina Stephenson was born in the desert and by the age of two she was very good at building sand castles. As a child she loved making up stories and making a mess with paper, paints and glue. She still does, although now she clears up the chaos herself. She was a day dreamer at school and her teachers despaired. She loved film and television and later developed a passion for theatre. She wanted to be an actress – singing and dancing in musicals – but she was painfully shy so she didn’t even try. After school she trained as a set and costume designer and had a successful career in theatre and Children’s Television until she had her children. Wanting to stay at home with them she turned her hand to illustration, working at night in an attic in a house in London (it was a very nice attic) where she illustrated many non- fiction books. Inspired to write her first picture book by her son Charlie (who does not have Stinky Socks), she showed it to a friend in the book trade. Thankfully for us he recommended that she send it to Egmont. With a change in artwork style, the bold, brave Sir Charlie Stinky Socks embarked on the first of his many really big adventures. 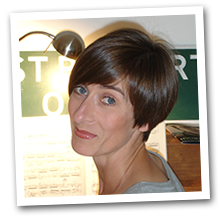 Kristina now lives in Wiltshire with her husband, who is a musician, her daughter, her son, a dog, two cats and a tortoise. She juggles work with family life in a busy, bustling house without an attic – now she writes in an old turquoise VW camper van called BRU. She loves her work but she still loves the theatre and she’s not as shy as she used to be, so … who knows. Do you have a question for Kristina? Ask a grown-up to fill in the form below to contact Kristina. This will only ever be used by the author to respond to your message.